St. Martin's Press, 9781250015549, 292pp. Hildy Good is a townie. A lifelong resident of an historic community on the rocky coast of Boston's North Shore, she knows pretty much everything about everyone. Hildy is a descendant of one of the witches hung in nearby Salem, and is believed, by some, to have inherited psychic gifts. Not true, of course; she's just good at reading people. Hildy is good at lots of things. A successful real-estate broker, mother and grandmother, her days are full. But her nights have become lonely ever since her daughters, convinced their mother was drinking too much, staged an intervention and sent her off to rehab. Now she's in recovery more or less. Alone and feeling unjustly persecuted, Hildy needs a friend. She finds one in Rebecca McCallister, a beautiful young mother and one of the town's wealthy newcomers. Rebecca feels out-of-step in her new surroundings and is grateful for the friendship. And Hildy feels like a person of the world again, as she and Rebecca escape their worries with some harmless gossip, and a bottle of wine by the fire just one of their secrets. 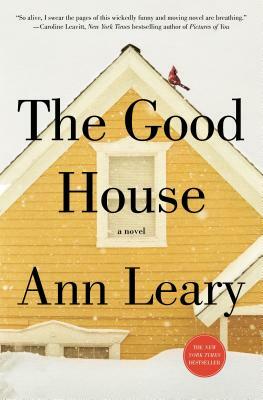 THE GOOD HOUSE, by Ann Leary is funny, poignant, and terrifying. A classic New England tale that lays bare the secrets of one little town, this spirited novel will stay with you long after the story has ended. Ann Leary is the author of the memoir An Innocent, A Broad and the novel Outtakes From a Marriage. She has written fiction and nonfiction for various magazines and literary publications and is a co-host of the NPR weekly radio show Hash Hags. Ann competes in equestrian sports and is a volunteer EMT. She and her family share their small farm in Connecticut with four dogs, three horses and an angry cat named Sneakers.